Odlewnia Żeliwa Simiński-Ordon Sp. z o.o. 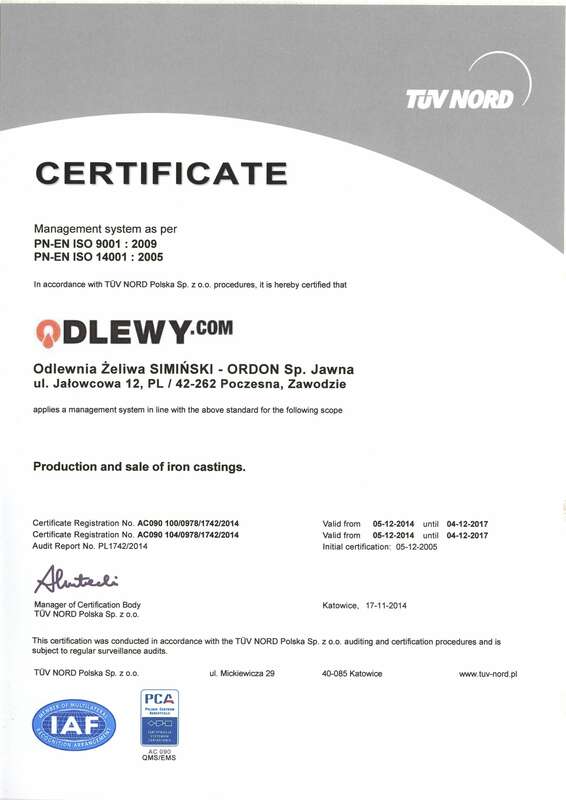 S.k.Certificates - Odlewnia Żeliwa Simiński-Ordon Sp. z o.o. S.k. Quality is one of the main values ​​that guide our company. We make sure to maintain the most hi-tech production level by working on efficient and modern equipment and by hiring well qualifield employees. The production process is running smoothly and safely because we do follow procedures. We are aware that we produce components which are a part of complex projects and their quality affects the functionality of the entire machine. Therefore, we pay attention to all the details in order to make a final product which fully complies with the technical drawing and fulfills customer’s requirements and expectations. Simiński-Ordon Cast Iron Foundry has introduced system of quality management according to the PN-EN ISO 9001: 2009 standard and environment management according to the PN-EN ISO 14001: 2005 standard. The certificates were received in 2005 and 2008 respectively and there are renewed every year. In addition, the quality of our products is confirmed by the control certificates in accordance with Polish and European standards. At customer’s request we provide VDA and PPAP documentation.